Meet our beautiful and sweet 6 year young CHLOE! The Urban Dictionary defines a Chloe as "A girl who is amazing and talented. She is sweet and when she has to say something people will listen. If she ever spills out her heart to you then you know she really trusts you and you better not mess that up! She is just extraordinary and people who are lucky enough to meet Chloe will never forget her outer and inner beauty. You would want to keep her safe and always make her smile just to see that smile that will make your whole day. You would love her more than anything in the universe and you would want to spend forever with her." We couldn't agree more! Our beauty is sweet, chill, easy, housetrained, loves playing with other DOGS, loves playing in the water, knows 'sit' and takes her reward treats gently, is crate trained, and is overall amazing. Her fabulous amber eyes match her coat and look like she's been made up by a world renowned makeup artist; she's stunning! 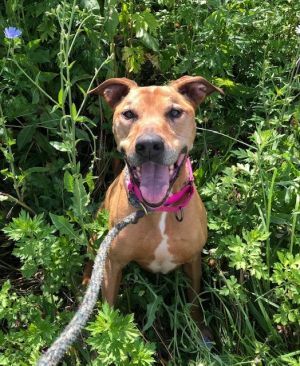 A perfect day for Chloe is a couple of nice easy walks, some play time, lots of cuddle time with her human, and some easy conversation in which she listens to your secrets with understanding and will agree with all your points of view!! Chloe can’t wait to find her forever home. She has so much love to give. She can be protective of her food and toys, so a home with adults and/or older children would be the best match for her. She is spayed, microchipped, up to date with vaccinations.